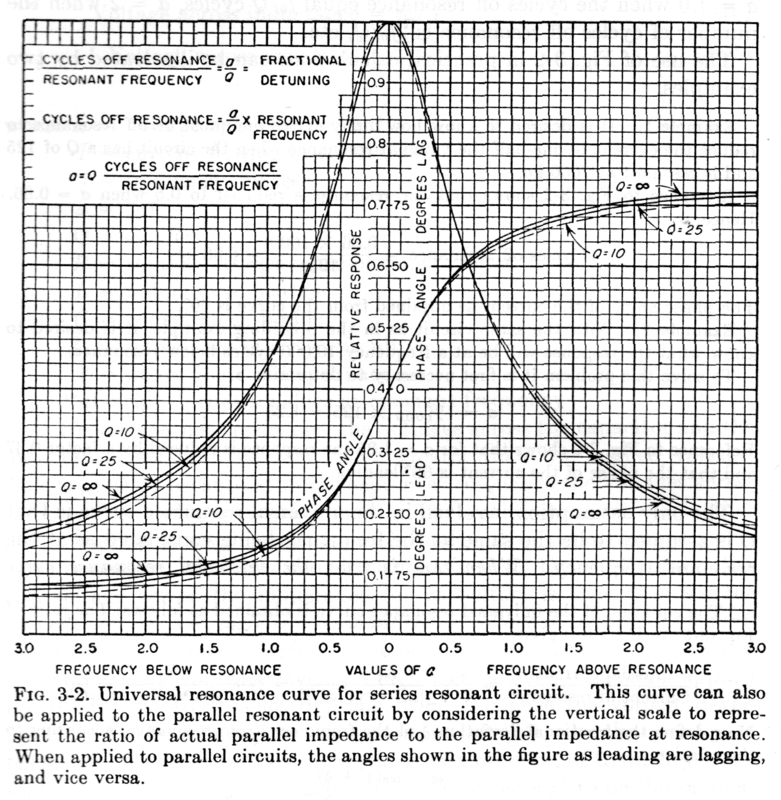 Above is a chart of the Universal Resonance Curve from (Terman 1955). The chart refers to “cycles”, the unit for frequency before Hertz was adopted, and yes, these fundamental concepts are very old. circuit Q is 2π(energy stored in the circuit)/(energy dissipated in circuit in one cycle) . capacitor: energy stored is C*Vpk^2/2 and energy lost per cycle is V^2/(2fRp) so Q= 2πfCRp=Rp/Xc. A RLC series resonant circuit is nearly as easy as at the instance when the inductor current is maximum, capacitor voltage is zero and hence the energy stored is as per the simple inductor case and Q=Xl/Rs. Likewise for a parallel RLC resonant circuit, at the instant of maximum capacitor voltage, inductor current is zero and hence the energy stored is as per the simple capacitor case and Q=Rp/Xc. Q and bandwidth are related, high Q circuits have a narrow response, narrow bandwidth. Q is a factor used in normalising the Universal Resonance Curve (URC) above, and appears in several of the equations on the chart. Lets focus in particular at the point on the URC corresponding to where |X|=R. When |X|=R, |Z| is 2^0.5 times that at resonance, and the current response is 2^-0.5 (or 0.707) times that at resonance. Since power=I^2*R, power at that point is half the maximum response. These are known at the half power points. If you look at the URC, you will seen that the current response is 0.7 of maximum when a=0.5. Taking the case for a=0.5 (the half power points) and noting that Bandwidth (BW) is measured between the upper and lower points, BW=2*CyclesOffResonance, we can substitute into a=Q*(CyclesOffResonance/ResonantFrequency) to obtain BW=ResonantFrequency/Q. This is a well known relationship. For a circuit where R is approximately constant with frequency, we can find the approximate BW by finding the frequencies at which |X|=R. 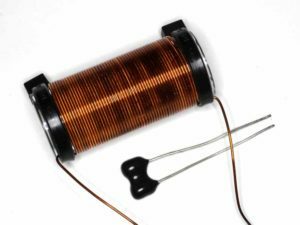 A series resonant circuit was constructed from an air cored solenoid inductor and 100pF silvered mica capacitor. 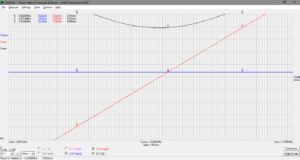 The following charts estimate the inductance and resistance of the inductor at 3.5MHz. 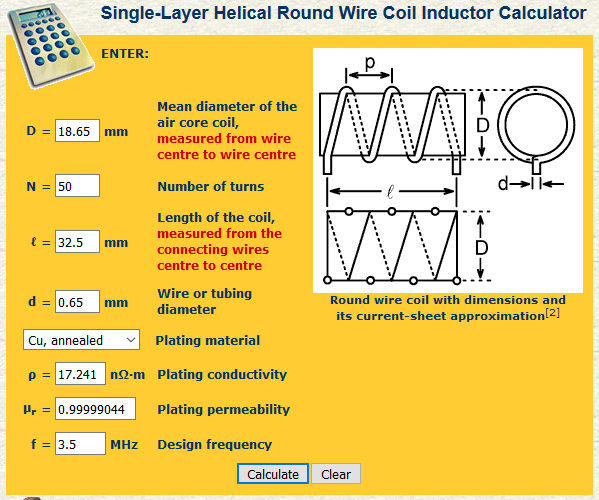 Above, the electrical parameters estimates. 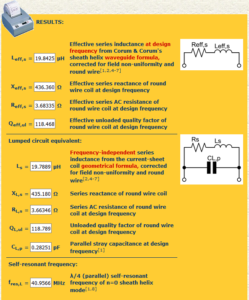 The key ones are an inductance of 19.8µH and resistance of 3.7Ω. The resistance of the inductor will dominate, silvered mica capacitors are very low loss, so we might expect the circuit Q to be just a little worse than that of the inductor, so Q somewhere towards 119. 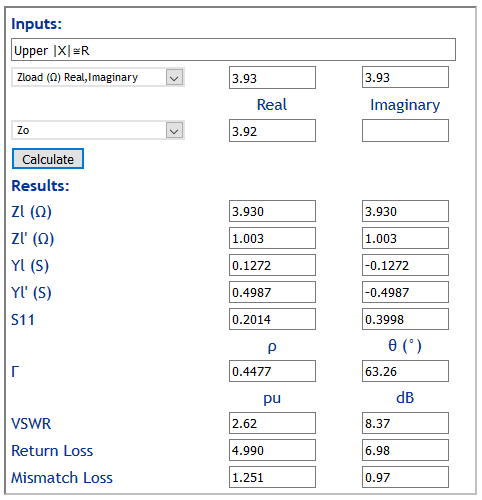 Calculated resonant frequency is 3.58MHz, but real world tolerances will lead to a small error in that estimate. Expectation is that half power bandwidth will be somewhere a little less than 3580/119=30kHz. The series circuit was measured using a VNWA3. Above is a plot of R, X and |Z| about resonance. Marker 1 is at resonance, Markers 2 and 3 are at the lower and upper points where |X|≅R. Note that R is very slightly dependent on frequency, a natural consequence of skin effect in the coil conductor. 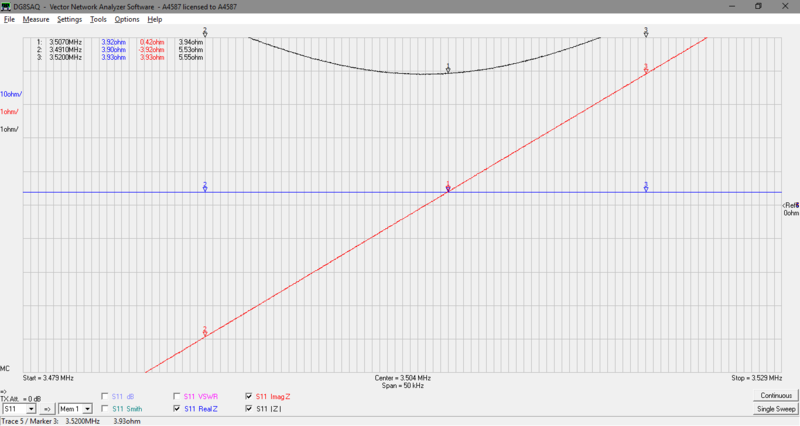 BW=29kHz, Q=121, very close to expectation. One of the shortcomings of the VNWA3 software is that it does not calculate / display VSWR or Return Loss in terms of an arbitrary reference impedance, so we must calculate the VSWR and Return Loss at Markers 2 and 3 in terms of matched impedance using another calculator. 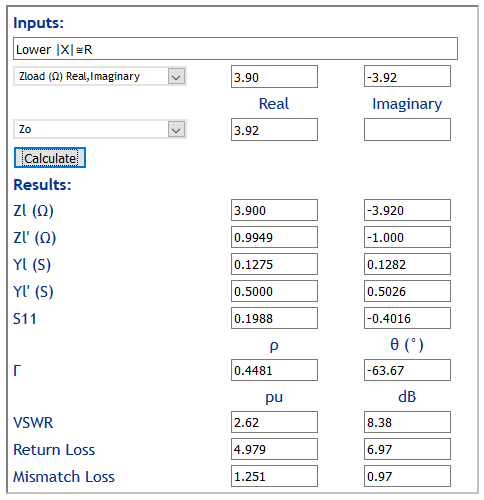 Above, at the lower |X|≅R point, VSWR=2.62 and ReturnLoss=6.97dB. Above, at the upper |X|≅R point, VSWR=2.62 and ReturnLoss=6.98dB. Hams tend to happily give different meaning to well known terms and concepts that have been part of the knowledge of a hundred years, indeed foundation knowledge on which bigger concepts are built. 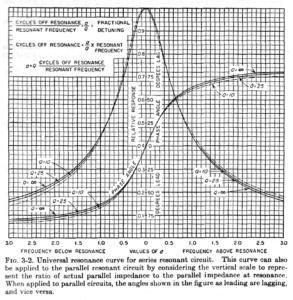 There is a following in ham radio (where popularity defeats science) that the half power bandwidth for an antenna is the bandwidth between points where ReturnLoss=3dB (VSWR=5.85). the condition does not imply |X|=R (in fact it implies |X|=2*R, a natural consequence of the unconsidered inclusion of the source R in the circuit). Since VSWR=5.85 implies |X|=2*R in this scenario, |Z| is (1+2^2)^0.5 times that at resonance, and the current response under constant voltage drive is (1+2^2)^-0.5 (or 0.447) times that at resonance. Since power=I^2*R, power at that point is one fifth the maximum response. Above, plotting the current response of |X|=2*R (I=0.447) on the URC, we get a=±1, twice the bandwidth of the half power points. The half power bandwidth of the RLC network is in fact half the difference between VSWR=5.85 frequencies. 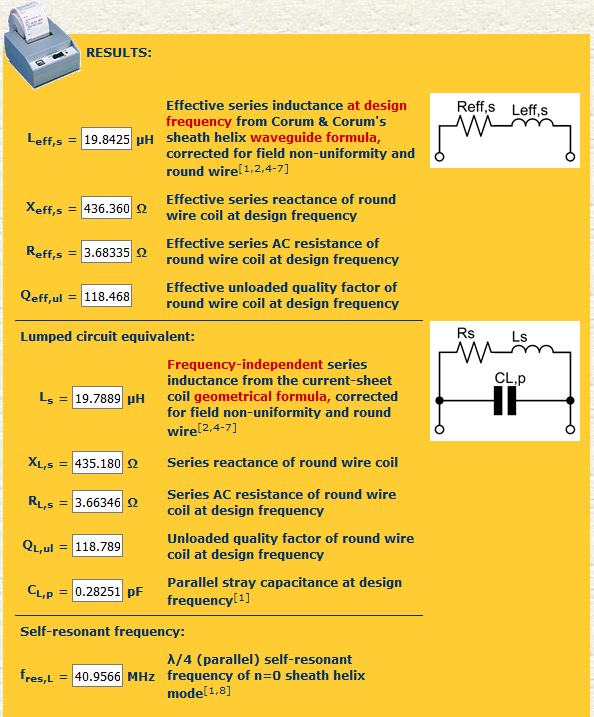 The article presents a theoretical analysis of a series RLC circuit using classical circuit analysis techniques, and theory based on a recognised text. The well known meaning of “half power points” of as series RLC circuit was derived in terms of R and X, and VSWR(R) and ReturnLoss(R). 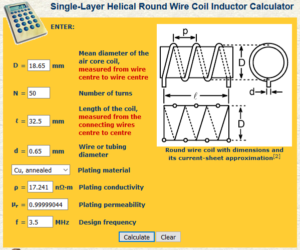 The experiment designed and made an inductor, and with it a series RLC circuit which was measured to demonstrate the theoretical analysis. The experimental results reconciled very well with theoretical prediction, Fo was very close to expectation, measured half power bandwidth was in line with expectation, inferring a Q in line with expectation. Terman, Frederick. 1955. Electronic and Radio Engineering – 4th ed. New York: McGraw-Hill.